This week has been one of my busiest weeks all summer. 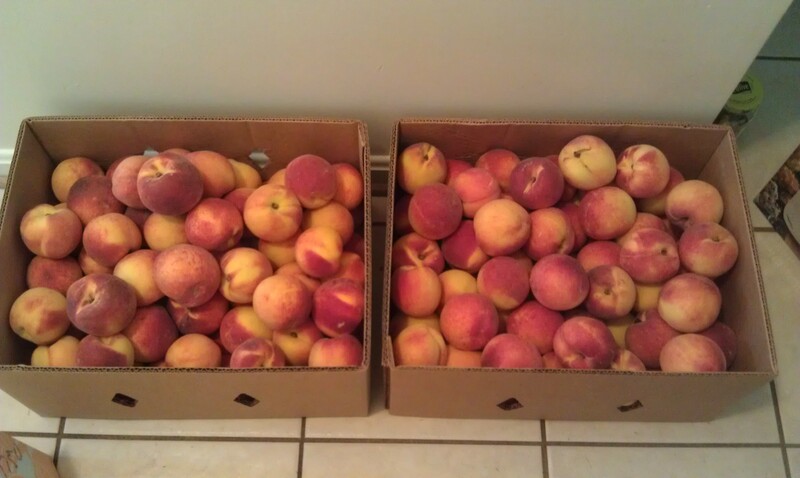 In addition to working outside the home for over 50 hours, I had 50lbs of peaches, 25lbs of tomatoes, and 10lbs of blackberries to can. On top of all that, I’ve been taking care of my chickens, trying to find time to blog, and shipping off some of the vintage goodies I’ve been picking up at flea markets and reselling online this summer. 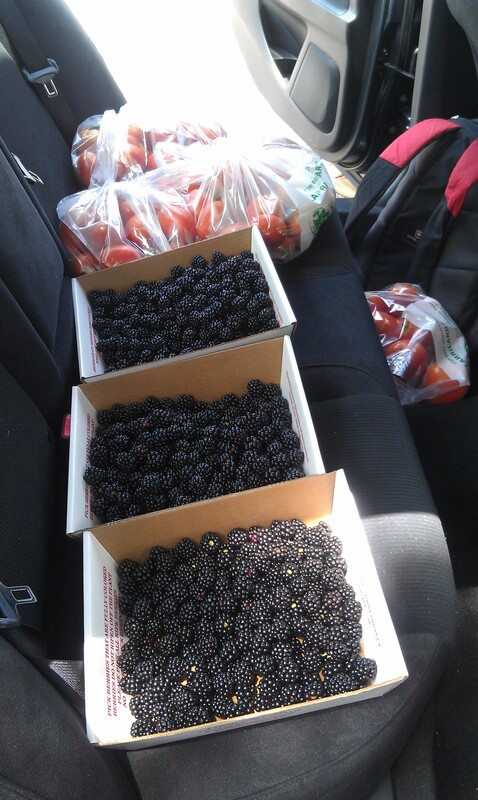 With the wonderful help of Savvy Momma and Nerdboy, we were able to put up 16 jars of blackberry jam, 4 jars of blackberry BBQ sauce, 24 quarts of peaches, 5 jars of pickles (it was 6 but 1 exploded), and 6 jars of peach honey. 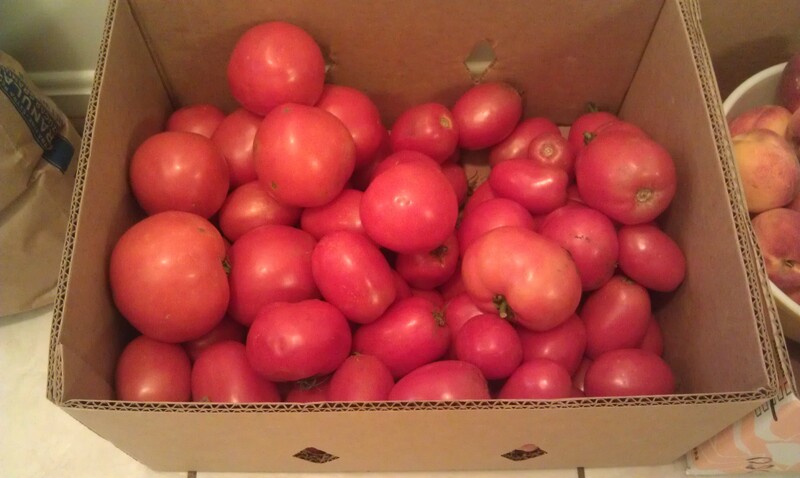 So you are probably wondering where the 25lbs of tomatoes ended up, right? They are in the trash. And not just 25 pounds of whole tomatoes, but 25lbs of hand picked, peeled, diced, cooked tomatoes with fresh herbs and garlic that my mom and I spent the entire day preparing. I was cooking it down on the stove (hotter than I should have) so I could quickly can it up before going to bed. I sat down for a minute at my laptop for the first time all day and that’s when I smelled it. 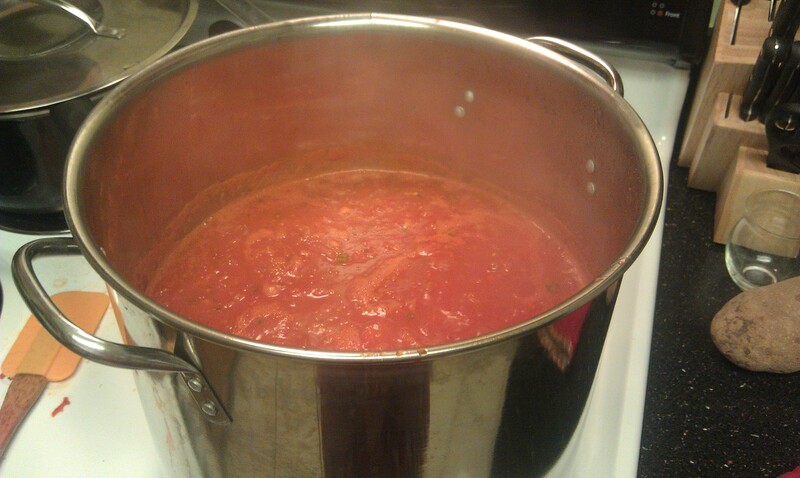 The bottom of the pot (dang cheap, thin pots) scorched leaving my entire pot of tomato sauce smelling like smoke. It was awful. The smell was sickening all night long. 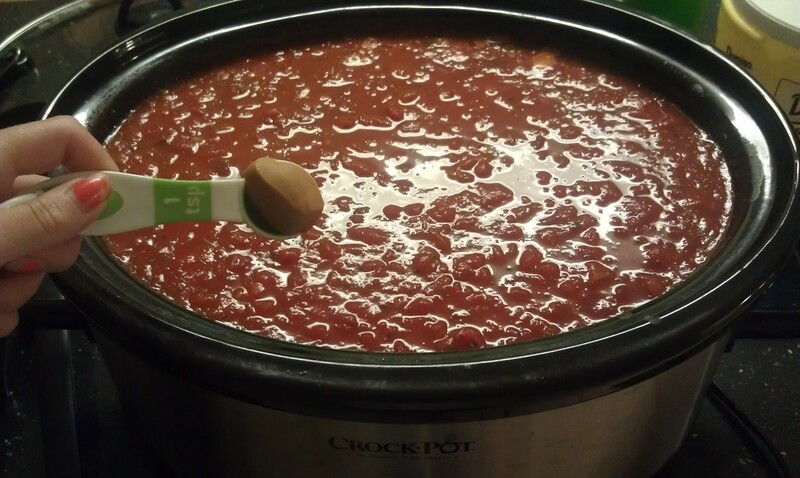 I tried everything I could to save the sauce; I moved most of it to the crockpot, added a raw peeled potato, more seasonings, more garlic, sugar, lemon juice, wine… and even peanut butter (I read it online. I was desperate). Nothing helped. I let it cook in the crock pot some more in case some miracle would come in and save it. 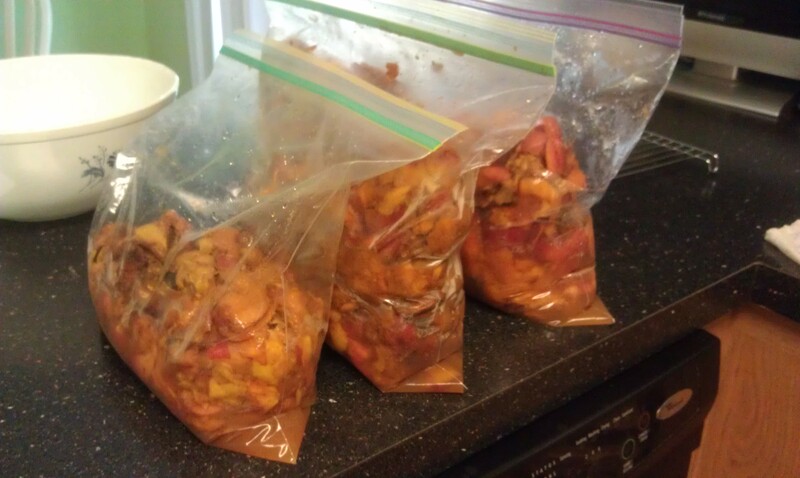 Finally, my mom pulled the cord of the crockpot, the sauce cooled down, and it was dumped outside. Are you shedding a tear with me yet? It’s such a shame to waste all of those beautiful tomatoes and all that time we spent on them, but there was nothing I could do. We ended up with a lot of nice canned goods we’ll be able to use all year. It has already been a few days since the tomato sauce incident so I’m doing my best to forget it ever happened and to move on. I’ll be asking for a set of new big pots of Christmas. Nerdboy and I are tired of using an SOS pad to scrub the pots down after every.single.use. They are just so thin and don’t transfer the heat around the entire surface of the pot. 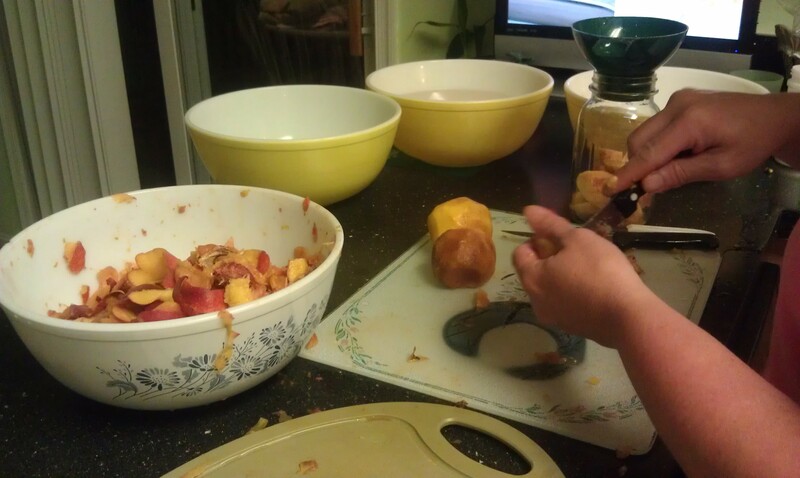 Our next canning adventure might be apples if we feel like it in the Fall. I’m sure we’ll do a few more jars of stuff in between since I haven’t pulled out my Presto Pressure Canner in awhile (lets you can anything low acid, like soups, beans, and more!). I love that canning allows us a way to preserve food when it’s in season and then enjoy it all year. 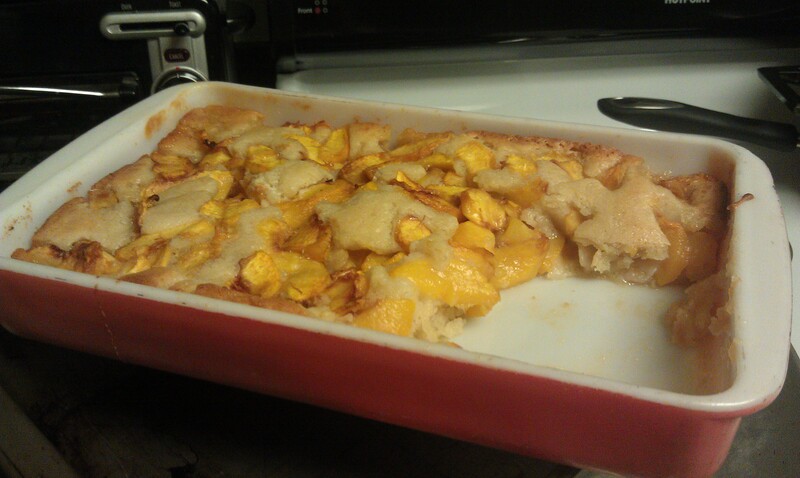 The peaches are so wonderful (though I wasn’t thrilled at the quality this year) you can eat them out of the jar with a fork, dump over vanilla ice cream, and of course, make a peach cobbler! 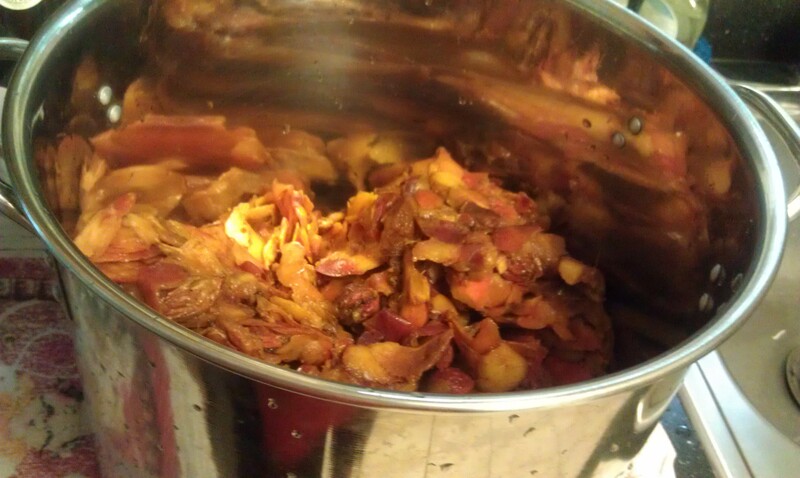 To make peach honey, we made a “peach juice” from all the tossed peach skins and pits boiled in water. From that strained juice, I added some sugar and a little pectin for a thickener. It will make an excellent sweetener for hot tea and also a great sauce for pork or ham! I love using up the parts people normally trash to make a usable and delicious product! We did the same with apple skins and cores last year when we made apple jelly. I’m off to grab some hot tea (with peach honey!) and maybe a brunch with eggies from my backyard. I have to go start yet another busy weekend! I need to sit down sometime soon and do some *gasp* school preparations that I have been waiting until the very last minute to complete. Oh…so sorry to read about the tomatoes. It is really frustrating to spend time and money on ingredients only to have to throw them away. I recall having to toss homemade caramels once and my blueberry jam is funky this year. I think the blueberries weren’t quite ripe enough…or maybe it was the no cook pectin. It’s freezer jam so there aren’t many things that can go wrong but what a disappointment….anyway I’m using it in muffins. Trying to make the best of the situation. 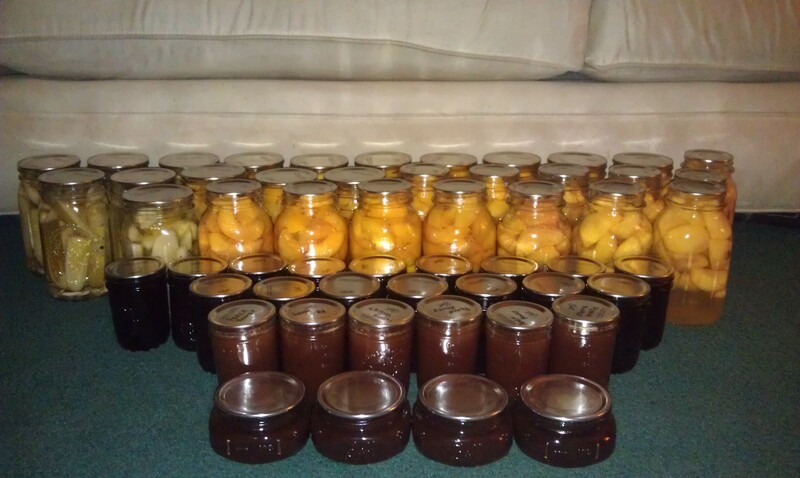 I LOVE how you’ve been canning, picking, growing and even RAISING some of your own food! I would love to be able to do that too but I have a picky palate. lol.